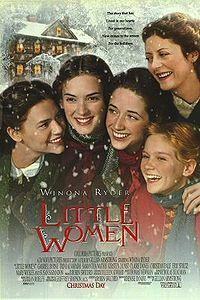 Little Women is a 1994 American drama film directed by Gillian Armstrong. The screenplay by Robin Swicord is based on the Louisa May Alcott novel of the same name. It is the fifth feature film adaptation of the Alcott classic, following silent versions released in 1917 and 1918, a 1933 George Cukor-directed release, and a 1949 adaptation by Mervyn LeRoy. It was released exclusively on December 21, 1994, and was released wide on December 25, 1994, by Columbia Pictures.